As we are preparing our trip to Sri Lanka we read up on Buddhism and we also recall some of the impressive Buddhist sites in the world we have visited over the years. Particularly stuck in our mind are the Buddhist grotto complexes of China, which is why this post will be about our visit to the UNESCO-listed Buddhist Longmen grottoes near Luoyang in the Chinese province of Henan. During the course of the Chinese history Luoyang has several times been the capital town of the whole realm. Notably, Luoyang was the place where the first Buddhist temple in China was built in the 1st century AD: The „White Horse Temple“ – a sightseeing spot in its own. But the main tourist draw of Luoyang is 13 km south of the town: the Buddhist Longmen Grottoes. In 493 AD, the Northern Wei Dynasty, which had recently converted to Buddhism moved their capital from Datong to Luoyang (for political reasons) and started digging grottoes for Buddhist worship in the cliffs that lined the shores of the Luohe River. The first caves were financed by private donors, but soon the state started financing them as well. After the fall of the Northern Wei construction stopped and reached a new peak during the Tang Dynasty. The Tang Dynasty capital was the powerful city of Xian further west, but Luoyang came briefly back into the limelight when Wu Zetian became empress in the late 7th century. She was the only female emperor in Chinese history and originally started out as a concubine to emperor Taizong. After his death she continued her career marrying his son and successor, Emperor Gaozong, survived him, too, and finally, having pulled the political strings in the background for a long time, became Empress. To get away from the recrimination of the noblemen and the bureaucracy she shifted the focus of power back to Luoyang, and as a devout Buddhist sponsored the erection of many temples and statues there. Altogether there are around 1400 caves and niches and 110 000 Buddha statues carved out of the rock at the Longmen Grottoes, the smallest ones not more than 2 cm and the biggest one 17 m in height. The earlier statues of the Northern Wei have slightly prolonged faces while the Tang statues have the typical round features of their time. Around 60% of the grottoes date to the 7th to 9th century (Tang-Dynasty) and around 30% are from the 5th century (Northern Wei Dynasty). Modern conservation work started in the 20th century and the site got UNESCO World Heritage status in 2000. Are the Longmen Grottoes worth visiting? If you are interested in Buddhism and especially in the development of Buddhist art, the Longmen Grottoes are a must. Not so many tourists visit, which makes the site quite charming. Buses go directly from the centre of Luoyang to the grottoes, which are located about 12 km out of town. Would you like to visit the Longman grottoes, and which (other) Buddhist site did impress you most? In the Chinese zodiac, 2012 will be the Year of the Dragon, which is conveniently also a very lucky symbol! Our guidebook on Nile Cruises will be published early this year, in time for the ITB travel fair in Berlin in March, where Egypt is the main partner country. Photos of Uzbekistan from a trip in 2004 are now online. At a height of 44 meters the Emin Minaret is the tallest minaret in China and dates back to the 18th century. The mosque is still in use today, and just behind it stretch vast vineyards. In the afternoon, without the chinese tour groups, the place is a very pleasant and spiritual spot. „Silk Road“ – that evokes images of oriental cities and caravans laden with huge bundles of silk, making their way through endless deserts and over rough mountain passes., While the term “Silk Road” was only coined by the German geographer Ferdinand von Richthofen in the 1870s, the Silk Road itself is of course much older. It was established around the middle of the first century BC, after camels had been domesticated for the first time (horses wouldn’t survive the long desert stages). Caravans then started to transport silk, which was highly in demand in ancient Rome, on the direct route from Asia to Europe. Silk was not the only commodity on the Silk Road, however: the traders also brought spices, carved jade, and medical rhubarb (against constipation) from China to the West, while horses, glassware, gold and silver goods were transported in the opposite direction. Apart from commodities, religions (most prominently Buddhism, but also Manichaeism and Nestorianism), fashion, music, and life style traveled on the Silk Road. This was how Polo, imported from Persia, became a popular recreational sport, and Western chairs replaced the Asian floor mats during China’s Tang Dynasty. In the opposite direction the Chinese noodle found its way to Italy. Just as the Silk Road was not only a road for trading silk, it was also not a single road, but a whole network of roads. All of them originated from Xian. Beyond Dunhuang the vast Taklamakan desert begins: its name originally means “go and you will not come out.” Thus, the road splits into a more direct and dangerous Southern route (Loulan – Hotan – Kashgar) and a Northern route that circumnavigates the desert along the course of today’s railway line, passing the oasis towns of Hami, Turfan, and Kucha. Both routes meet in Kashgar, only to split again. Traders could move over the Pamirs towards Pakistan and India or westwards to Samarkand, Bukhara, and Merv, continuing via Persia to Turkey and Europe. The trade along the Silk Road reached its peak during political stability of the Tang Dynasty, which was briefly resumed under Mongol rule (under Kublai Khan) in the 13th century. But with the discovery of new sea routes (Cape of Good Hope) the Silk Road lost its importance. Today, not that much is left of the glorious past. In the early 20th century, Western and Japanese archeologists competed in digging out as many relics as they could, taking away the best-preserved statues, frescoes and manuscripts. The most beautiful artifacts of the Silk Road are now in London, Berlin, Tokyo and Washington. From today’s perspective it does look like theft and vandalism, and indeed official notices in some of the empty caves accuse the foreigners of imperialist arrogance. But seeing the current state of the sights changed our point of view somewhat. The Western archeologists (who acted in a legal framework) all regretted in their expedition diaries that they could only take a small part of the beautiful artwork. But today almost none of the remaining frescoes are intact. Many of the defacements are apparently caused by Fanatic Muslims and Red Guards in the 20th century. Ignorant Chinese tourists have left countless graffittis in the caves. As we mentioned before, the restoration work undertaken by the Chinese often seems to lack scholarly and/ or scientific backing. Thus, the “stolen” artifacts in Western museums are much better preserved and protected than those the explorers had left behind. In the British Museum in London, almost none of Sir Aurel Stein’s finds are displayed. Getting up to pay our Internet bill, we noticed the Uighur boy in the next booth playing one of those grisly violent online games. On a second glimpse we realised that he was watching a video where someone was just being violently beaten up. The young woman wearing a headscarf on the boy’s other side also looked up, and then she too watched in horror as a severed head was placed on the dead body, like a trophy. We don’t know who was attacked by whom, and where nor why the boy was watching the scene, but the experience was disturbing, and in a predominantly Muslim area somewhat frightening. The Uighurs we meet are generally very friendly. They smile much more than the Chinese, and their stares (yes, they stare, and so do we) are curious rather than annoying or threatening. Wearing a short-sleeved T-shirt or talking to Muslim men does not seem inappropriate. On the surface, Chinese and Uighur people also appear to get along well. However, we knew that there is an independence movement, with suicide bombings a few years ago in Xinjiang’s capital Urumqi. A closer look reveals some reasons for tensions. Even after decades of migration programmes for Han-Chinese from the overpopulated coast to the minority regions, the majority of Xinjiang’s population are Uighurs. Yet most government-paid posts as well as the more prestigious jobs seem to be occupied by Chinese. Conveniently for the Chinese applicants, Chinese language skills are imperative for higher education and better positions. The everyday language however is Uighur, and many Uighurs do not speak much Chinese. Uighur belongs to the Turkic language family and has in the past been written in a variety of scripts (including its own Uighur script which has been printed in movable type a hundred years before Gutenberg). Today, an adopted version of Arabic script (with vowels!) is used. If it weren’t for the street signs written in Chinese with additional Arabic and Latin alphabet, it would be hard to believe that the sandy back alleys that make up most of Xinjiang’s smaller towns belong to China. They are populated by Uighur families with many children. 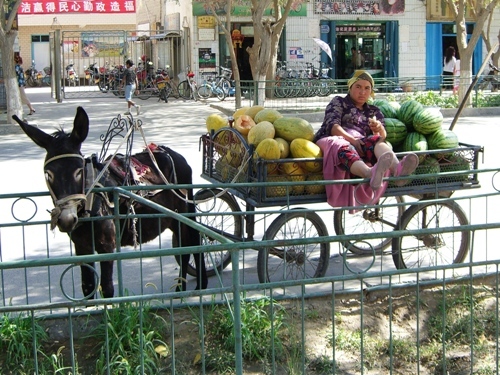 Fruit sellers pass on their donkey carts, shouting “Posh! Posh! Out of my way!” Old women with headscarves sell fresh yoghurt on little tables in the middle of the street. In the centre of each town, by contrast, there is a Chinese quarter of about two blocks with paved sidewalks, where the banks, department stores, and expensive hotels are situated. Shoppers as well as the staff are almost exclusively Chinese. Even to us, the propaganda efforts invoking the inseparability of Xinjiang from China, the “Chineseness” of the Uighurs and the great contribution made by the Western regions to “our beloved homeland China” are very obvious. 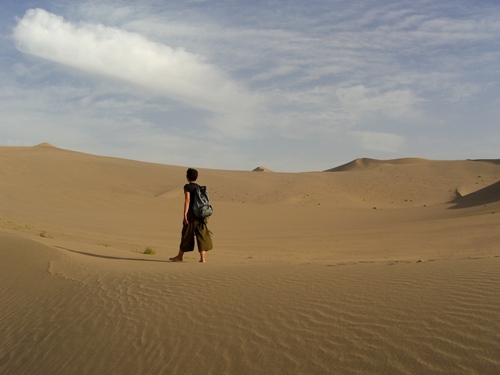 They are bolstered by efforts to Sinisise the Uighur elite: a female Uighur student we met on an overnight bus had just spent 5 days to travel home to Hotan from her university on the coast. “I had no choice” she explained in fluent English “if I wanted to study I had to go to the coast”. With her tight T-Shirt and the Baseball cap over her dark curly hair, she indeed stood for the integrated minority the Chinese government is trying to generate. We wonder if this policy will succeed. 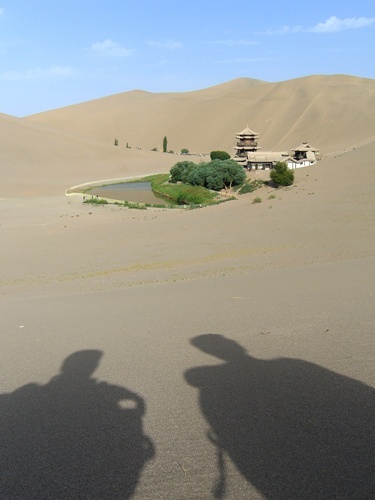 The peaceful desert temple at the Crescent Moon Lake has been described by travellers for a long time. Today the “temple” is a concrete structure with tourist facilities, and the lake has only been re-dug in the 1980s. We have been travelling for 6 weeks in China now and so far didn’t encounter any major problems (the biggest one being the cold we just caught). Carrying a heavy backpack with all the climbing/ hiking gear and a notebook was something we had to get used to. Sometimes it is still difficult to enjoy sightseeing knowing the notebook back in a more or less secure hotel room. On the other hand, who would have thought that a hotel room becomes homier if your own desktop is waiting for you offering cheap DVD entertainment and the possibility of displaying travel expenses as pie charts. No weekends, no “day off” is equally difficult to get used to. There is so much to see, but the everyday stuff also takes up more time than we thought: Shopping and washing, editing and archiving photos (with the notebook!) writing the next blog entry and travel diary, reading about the next destination etc. We are still experimenting with our travel speed, trying to avoid the feeling of sightseeing-stress on the one hand but also the dissatisfaction of wasting a precious day for “profane needs”. In preparation for the stream of visitors expected for 2008 (Beijing Olympics), most of the sights are undergoing massive restoration - in some cases quite large areas and the most famous parts are not accessible to visitors. Except at some major sites with international cooperation, often apparently no art historians are involved. Artisans paint over the historic relics in new bright colours and add a plaque full of superlatives and self-congratulations on thousands of years of history. Sadly this history is often not visible anymore and even being destroyed as we watch. At least there is one unbroken tradition: food! On the menu, meat, fish and vegetable dishes are listed separately, and there is always a large choice of delicious vegetarian dishes. Compared to other costs, food prices are very low (wait for our pie charts!). Hotels are also usually a very good deal as prices have significantly decreased since the system of special foreigner hotels has been abolished. Even the cheaper rooms offer hotel standard such as television, clean sheets, towels and 24 hour hot water. Roads, however, get worse as we move westwards. We have spent hours in buses creeping over mere sand pistes, seeing lots of new highways being built that are, alas, all unfinished as yet. The train is far more comfortable and punctual, but tickets are often difficult to obtain. Today we have arrived (by bus) in the Xinjiang Autonomous Region, a part of China populated mostly by muslim Uighurs. We are looking forward to more Nan and pilaf and keep you informed about our progress westwards. Nice summer holidays to all of you. Emperor Shi Huangdi wanted to be immortal. It could have been possible. He had just conquered every kingdom he knew and proclaimed himself the First Emperor of China. His alchemists had powerful recipes to prolong life. In case his body should die, Shi Huangdi prepared a huge underground palace where his soul could live on. Statues of servants, horse-carriages for outings and bronze ducks swimming in artificial rivers and lakes made from mercury should guarantee his comforts. This underground palace was guarded by the famous life-sized army of terracotta warriors. 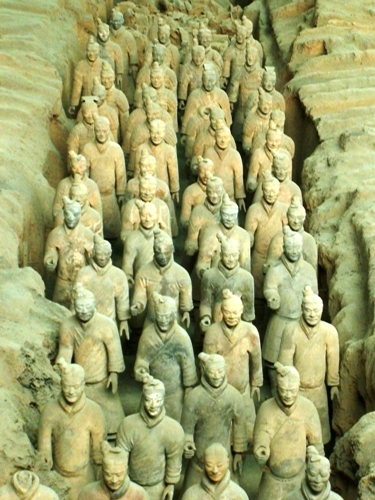 Today, the terracotta army is touted as the 8th wonder of the world, and large halls cover the excavation site. Although the sheer size of the exhibition area is impressive, the presentation of the artifacts themselves appeared somewhat sad. Only five of the most well-preserved warriors were shown for a close look in a corner of excavation pit number 4, without much explanation. Of the seven “Generals” found so far, only one was present. Other figures stand forlornly in the almost empty pits. Admittedly we are spoiled: We have previously seen terracotta warriors and other items from the excavations in three excellent exhibitions in Tokyo. At that time, we appreciated China’s willingness to let the warriors travel around the world. Xian, the old capital, is considered to be the official beginning of the silk road. The visible Muslim minority contributes to the city’s cuisine and culture. One of our Xian highlights was the visit to China’s oldest mosque. At first sight it looks like a Chinese temple, but the orientation towards Mecca as well as Arabic inscriptions above doorways and on the walls show its Islamic denomination. Among the many other sights – a fantastic history museum, a huge old pagoda, the excavation site of a 5000 year old village, etc. – is a temple that may only be of interest to visitors from Japan. It is the place where Kōbo Daishi, the founder of Shingon Buddhism in Japan (see our first blog entry: 88 pages of Shikoku) studied as a foreign exchange monk in the 9th century. Leaving Xian proved difficult because the university holidays had just started and all trains were fully booked. Spending half a day in various ticket offices we could finally secure two tickets for a sleeper bus to Xining. Emperor Shi Huangdi may have died, and his underground palace smashed by the following Han Dynasty just a few years after his death, but the empire he founded is still huge. We are 1000 kilometers further west in the Tibetan Highland, and still Western China lies before us. We took a few days off from our sightseeing route and headed south to Yangshuo, Chinas only well developed climbing area. The train-ride from Xian to Guilin, 60 km away from Yangshuo, took 28 hours and we enjoyed our comfortable hard sleeper bunks reading, eating and doing nothing. Since it had rained in Beijing when we planned to go climbing, this was the first chance to use the climbing gear we are carrying (except for two visits to an artificial wall in a Beijing park). Dotted in the fields surrounding Yangshuo town, some of the crags are accessible by bus; for reaching others, we rented bicycles. Usually we went climbing as early as we could bring ourselves to get up (always before seven) and returned around 2:30 in the afternoon when the sun became unbearably hot. We are still not very good and lead-climbing feels scary most of the time, but luckily Yangshuo offers a variety of interesting easier (5.7 - 5.9) routes. In the afternoon we often dipped into the Li River for a swim. In order to blend in better into Chinese recreational activities, we have also bought a badminton set to play in the public parks. The Yangshuo-Guilin area is not only popular with climbers; it is famous for its spectacular landscape and visited by tourists from all over the world. 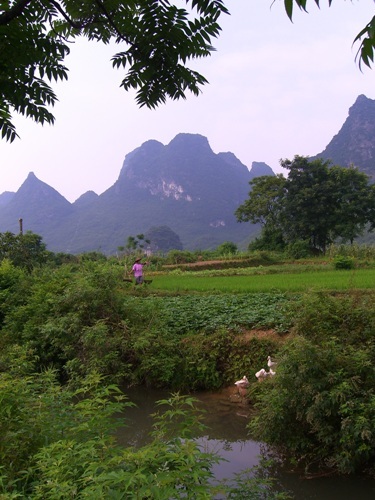 Set in rice fields and surrounded by fabulous Karst towers and podgy hills, Yangshuo still appears small and sleepy compared with nearby Guilin. Only around noon every day, the market street near the river becomes busy: About 60 cruise ships from Guilin let off hordes of tourists - from their scenic cruise down the Li River. For a few hours hundreds of souvenir stalls, fruit sellers and peddlers try to sell their goods at prices five times as high as the normal ones. So far, most of the Western tour groups stay in Guilin because there are few sufficiently big hotels with Western standards here in Yangshuo, but the town is quite popular with Chinese tourists. On the other hand it is developing rapidly (as we could witness from the change it has undergone since our first visit ten months ago) and definitely has the potential to become a major destination on the itinerary of Western visitors We hope to come back for more climbing in the future, but for now, we are going back to Xian (again by hard-sleeper) tomorrow night. Playing badminton in the courtyard of our hostel. We had spent several hours in a cramped minibus winding up the mountains. When we finally reached the pass of the mountain, the Wutaishan (五台山) valley lay before us. A group of fellow travellers got off the bus to climb to the temple at Yedou peak, one of the five holy mountains after which the area is named. Wutaishan is one of China’s sacred Buddhist mountain ranges. More than 100 temples, most of them Lamaist, are scattered across the area. Because of the remoteness of the region, they have survived the cultural revolution nearly intact. The temples with their strings of colourful prayer flags, their photographs of important Lamas and their prayer wheels were beautiful, but it was the atmosphere that got us. Taihua, where we stayed, is a small tourist village in the centre of the Wutaishan valley: nearly every house was a restaurant, souvenir shop, or lodging. Apart from a few Western and some more Chinese tourists, their customers included scores of monks and nuns belonging to various Buddhist sects. During the day we saw them eagerly touring the temples, praying and chanting. Some ran clockwise around the white stupa containing Buddha’s relics or approached a mountain temple in the slow traditional pilgrim’s way of kneeling and stretching out on every third step.. In the afternoon and evening, however, they had some time off. Then they went shopping around for religious goods in their vivid robes (red, orange, yellow, grey or brown, depending on the sectl). Like the other tourists they had an ice-cream or a Coca Cola and showed off their new sunglasses and sunhats. Once we saw a nun ringing the various models of prayer bells in a shop, trying to find the ideal one for her. 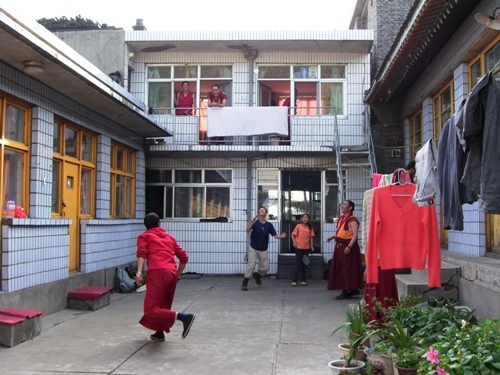 A group of about 10 young Tibetan monks stayed at the same hostel as we did. All of them were very curious about foreign countries and we regretted our poor Chinese. We went off hiking in the surrounding hills for a day. Although the mountains are not that high, there were few trees but many alpine flowers, including Enzian and some sort of Edelweiss (at least we think so). Cows were mowing on the green meadows. None of the paths was clearly marked, and some just disappeared somewhere in the pastures, but occasional stone heaps and scarlet cloths in the bushes indicated that these were also used by pilgrims. So we were again on a Buddhist pilgrims’ route!